Click the button below to add the 1953-1979 Ford F-100 Pickup 3 Row All Aluminum Radiator to your wish list. Will Cool Up To 850hp You will not find a better guarantee anywhere on eBay! Overall Dimensions: 26 3/8" high x 29 1/2" Tank Thickness 2 3/4"
Upper inlet: 1 3/4" located on passengers side. Lower outlet: 2" located on drivers side. OEM Mounting Bracket system Vert - 16 1/2" Horizontal - 27 3/8"
OEM style brass petcock drain. 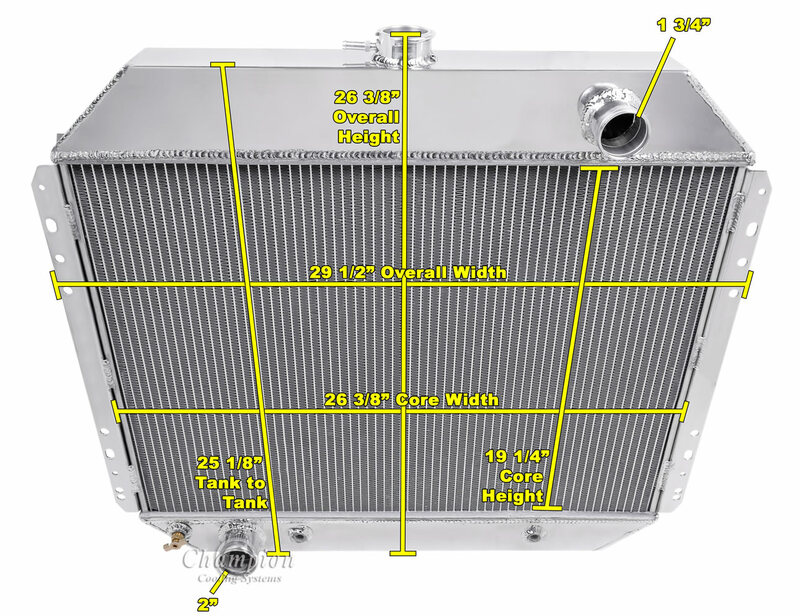 You could easily spend $600-1,200 for a 3 row radiator of similar quality.Buy with Confidence. Shipped via FedEx with Insurance. Call or email for shipping quote. PC, We have in listing slight mods may be required for instance the bracket can be reversed pre 68 so check if not sure and if so give us call we can change them. Excellent radiator and great people to deal with. I am restoring my 76 Ford F-250 highboy and the radiator they sent bolted right in. Everything lined up perfectly with absolutely no modifications. The radiator looks great and functions well. My only complaint would be the brackets. They seemed to be put on backwards. The radiator would fit with ease if the 29 inch wide brackets we're facing the motor. The other side of the bracket that measured 27.5 inches approximately were welded facing the motor which did not align with stock bolt holes. After some modifications by me I have the radiator mounted using the wider brackets that are farthest from the motor. Not sure if this was a mistake or the first time someone has passed on much needed information about the bolt width on a stock 65 f100 body frame. I understand that aftermarket parts don't always directly fit I'm just saying that it would have saved me time and effort if the brackets were welded differently. The radiator looks great and functions well. My only complaint would be the brackets. They seemed to be put on backwards. The radiator would fit with ease if the 29 inch wide brackets we're facing the motor. The other side of the bracket that measured 27.5 inches approximately were welded facing the motor which did not align with stock bolt holes. After some modifications by me I have the radiator mounted using the wider brackets that are farthest from the motor. Not sure if this was a mistake or the first time someone has passed on much needed information about the bolt width on a stock 65 f100 body frame. I understand that aftermarket parts don't always directly fit I'm just saying that it would have saved me time and effort if the brackets were welted differently.